As You See It Media was set up in December 2013 by BBC TV producer and journalist, Tim Jones, when he took redundancy from the broadcaster after 21 years. Since then, Tim has developed the company into a full-service digital content agency, offering everything from video production to photography, copywriting and web design. Most recently, Tim has expanded the business, bringing in his wife, Gail, to do the administration and forming a network of relationships with freelance cameramen, editors, designers, illustrators and copywriters. Throughout, Tim has maintained his journalistic routes, providing ‘story-led' marketing to clients, unearthing the unique selling points in a company or organisation and capturing the passion of the people who work within it to ‘sell' their products to others. "I was lucky to leave the BBC with a redundancy package, so I could buy the equipment I needed to get going in the private sector. It was still a major task and a terrifying thing to do after so many years working for one employer. I had transferable skills: I am a fully-trained BBC journalist and cameraman, but I didn't know how to sell myself to business people who were talking a different language. I had to learn how to make my skills relevant to corporate marketeers and convince them that they wanted me to help them tell their company’s story to the world. It worked, though, and recently it became obvious that companies didn’t want to shop around for someone to make videos, someone else to take photographs, write copy, design a website and so on; once they had formed a relationship with us, they were happy to trust us with the whole lot. So, we scaled up: calling on a network of trusted contacts from my days in broadcasting to help me offer a full digital content agency service. Offering more services means the ‘pool’ of work available is bigger. 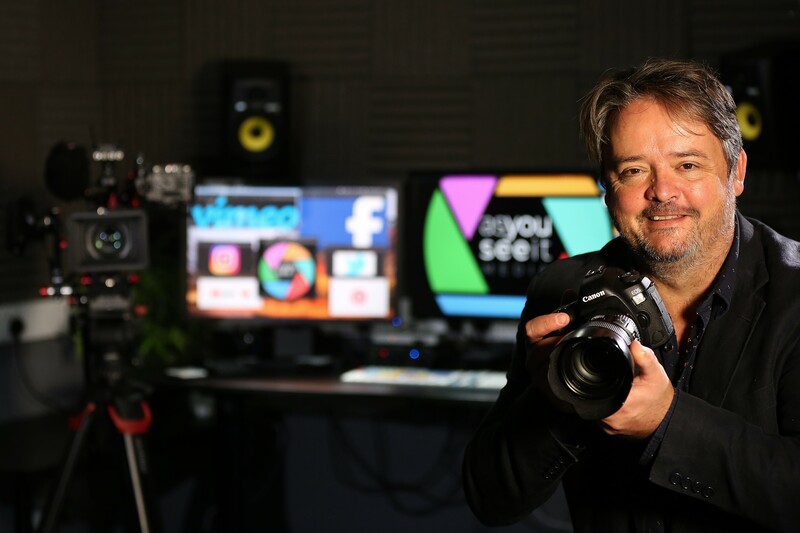 Collaborating with others means we don’t have to carry extra costs – we can skill-up as the opportunity arises, just as long as the client knows they will get our service to our standards in the end.” Tim Jones, Creative Director and Owner at As You See It Media. When Tim set up As You See It Media which combined his freelance reporting/camera work with his interest in social media, Steve Maggs, a Relationship Manager at the Welsh Government’s Business Wales service, was brought on board to assist with broadening the company’s offering. This meant providing a turnkey solution to potential customers including filming of quality video content, photography, social media management, copywriting and PR, website development and graphic design. With an impressive track-record in planning and implementing marketing campaigns and following the successful initiative that saw Crickhowell in Powys awarded the Best British High Street, Tim is continuously working with Business Wales and Superfast Business Wales to hone his social media and digital marketing skills as well as to acquire broader branding and marketing training. Business Wales is also helping him with human resources and skills/training issues.